Fresh, crunchy and packed with fresh herbs. Eat before the meal or as a refreshing side dish to a heavier main course. 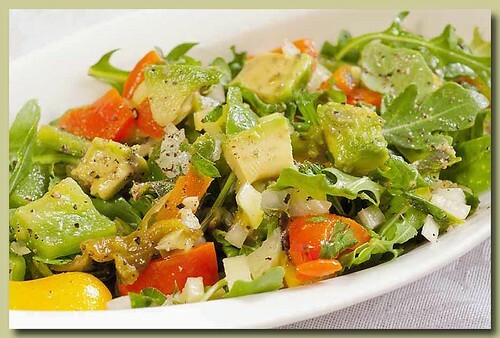 mixed with arugula and avocado. A few weeks ago some of my online foodie pals had an online cook-along. The theme for the cook-along was Tagine/Moroccan. I made an Oxtail tagine with beets and oranges. Alongside the tagine I served this country salad with bell peppers and chile. Both recipes are from the cookbook, Tagine, spicy stews from Morocco. You'll need some bell peppers. I used a little orange, yellow and green. onion, celery, green chiles, garlic, lemon juice, mint and parsley. Chop, slice and dice what needs to be chopped, sliced and diced. In a medium bowl, mix together the bell peppers, onion, celery and green chiles. Give it a quick toss and add the parsley and mint. The recipe calls for adding the garlic along with the pepper mixture. I opted to add it to the dressing. 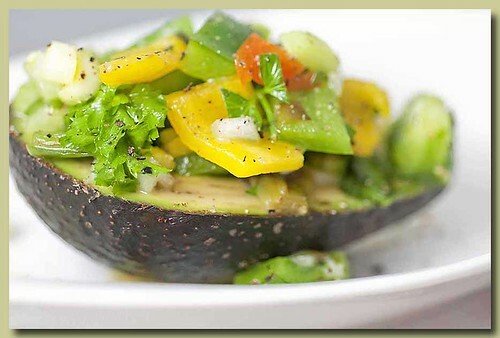 In a small bowl add the lemon juice, garlic, salt, freshly ground black pepper and olive oil. Whisk, whisk and pour over the salad. The recipe calls for adding the lemon juice and olive oil right over the salad. I opted to make a dressing with them along with the garlic cloves that were smushed. 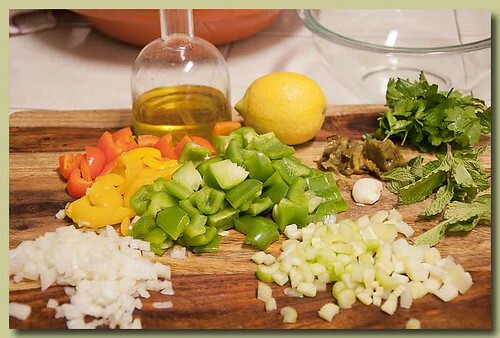 In a bowl, mix together the chopped onions, peppers, chiles, celery,garlic, mint, and parsley. *Add the olive oil, lemon juice and salt and pepper to taste. Toss the salad thoroughly and serve. * I mix the garlic, oil and lemon juice together before adding to the salad. This also can be served with arugula.